I still remember what it was like learning my first few Chinese characters. One of the things I kept asking myself was if it really mattered which order I wrote all those strokes! The end result looked more or less the same anyway, which meant nowhere near as pretty as in the textbook I used. I still persisted, mostly because the textbook I used had stroke order for each character included. I’m glad it had and I’m happy I learnt stroke order from the start. Students who learn characters with Skritter don’t really have that problem; you learn correct stroke order just by using the program, unless you have lowered the settings for stroke order strictness. Don’t do that. Let me explain why. Why am I happy I learnt stroke order from the start? Why is it so useful to have an app that integrates stroke order and helps you learn it? There are a few obvious reasons, but also a couple you might not have thought about. In this article and a follow-up article, I will answer these questions, along with other questions commonly asked about stroke order when learning Chinese. First, let’s look at some reasons why you should learn correct stroke order. Even though Skritter will help you with this by default, it doesn’t hurt to know why stroke order matters. It’s easier to write – Stroke order isn’t random. Instead, it reflects the most practical way of writing characters. You might not agree in some cases, but the more you write, the more you figure out that it all actually makes sense. We have stroke order in English too for the same reason. You don’t write the letter “l” from the bottom up, do you? Even though not every single case might make sense, in general, stroke order rules still make writing a lot easier. Also, by writing the same character the same way every time, your penmanship will improve too. The result isn’t the same – To the beginner student, the end result looks the same regardless if you follow the correct stroke order or not. However, this isn’t really the case. In handwriting, you can often see when someone has made a stroke order mistake. The faster you write, the more obvious it is. In quick, joined handwriting, wrong stroke order will result in illegible characters. So, even if the results look similar to you, they really aren’t. Of course, if you lift the pencil from the paper completely between each stroke and write very slowly, you could in theory write a correct character with the wrong stroke order, but I don’t really know why anyone would spend time and effort achieving that. It’s easier to read handwriting – This is the flip side of the previous argument. If you know correct stroke order, it’s much easier to figure out what normal handwriting (which is often semi-cursive) means. If you write in a different way following your own personal stroke order, it will be hard to decipher which strokes are joined with which in other people’s handwriting. Naturally, correct stroke order only makes it easier to read handwriting, it’s not enough on its own. It enables you to use handwritten input – This is convenient when you want to look characters up in a dictionary or write a character you don’t know how it’s pronounced. The crux is that modern handwriting recognition is pretty good, but only if you get the stroke order right. You can write very fast or inaccurately and it will still be okay, provided your stroke order is good. Just check the picture above! 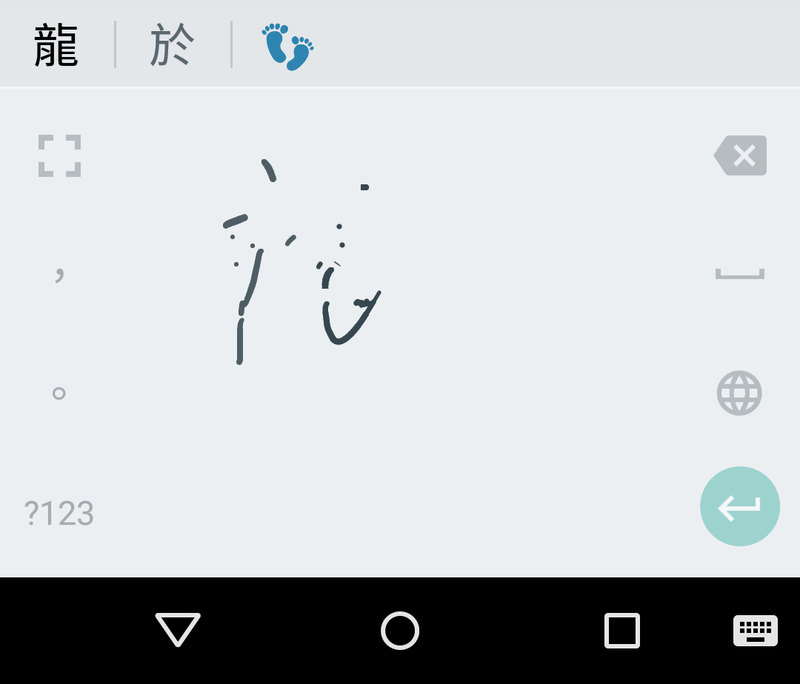 I intended to write the traditional character 龍 and even though the writing is extremely bad, my phone still figured it out because the stroke order and general placement were correct. Of course, I don’t think you should write like this, I just show it as an example. There’s no good alternative – Let’s look at the alternative, which would be improvising stroke order or inventing your own rules. There is no advantage with doing this. Even though you think that your version is better, that assessment is based on your very limited knowledge of Chinese. It’s very unlikely to still be a better way of writing once you’ve learnt a few hundred or thousand characters. Creating a consistent system on your own will be hard in itself, so if you’re going to write with a consistent stroke order, why not get it right from the start? Thus, you should learn the correct stroke order for the characters you learn to write. It might feel frustrating when you first start using Skritter, but you will quickly learn the stroke order rules and once you have done that, you hardly ever have to think about them. Since Skritter will prompt you if you get it wrong, you don’t really need to waste any time looking things up. This makes writing characters much easier. If you lower the stroke order strictness, you will have an easier time when you start out, but there’s really no good reason to do this if you take long-term learning into consideration. Instead, you should increase the strictness. If you’re going to learn to write, it makes sense to learn it properly. In the next article, I’m going to discuss what “correct” stroke order actually means. This might seem simple at first, but considering that stroke order is a matter of habit and is meant practically useful, it’s not hard to understand that several standards have evolved that all make sense and are correct in their own way. This is partly a regional thing, too, but the point is that there’s lots of variation, but more about that in the next article in this series.